Description: This coniferous tree is 30-120' tall, forming an unbranched central trunk with numerous lateral branches. Young trees typically have conical crowns, while older trees are more oblongoid and irregular. 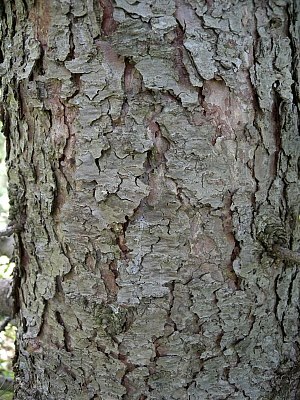 Trunk bark of mature trees is brownish or reddish gray and flaky, forming irregular fissures; branch bark is more smooth and gray. First-year twigs (typically 4-20" long) are pale yellow with alternate leaves, while second-year twigs are gray to grayish brown with clusters of 30-60 leaves. Both types of leaves are about ¾-1¼" long, needle-like in shape, and deciduous. During the spring, the leaves are light green, but they later become more dark during the summer. During the fall, they turn yellow before falling to the ground. On second-year twigs, the leaf clusters are produced on short spur-twigs less than 1/8 (3 mm.) long. In each cluster, the leaves are joined together at the base, from which they spread outward in all directions. European Larch is monoecious, forming both pollen cones and seed cones on the same tree. 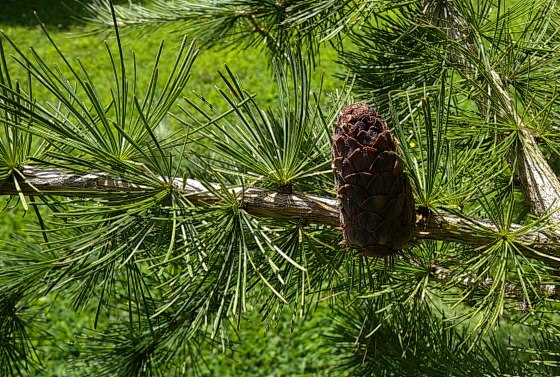 These cones are located toward the tips of second-year twigs during the spring. At this time of year, the small pollen cones are globoid-ovoid in shape and yellow, while the larger seed cones are ovoid in shape and dark red to reddish purple. Pollen cones consist of male (staminate) flowers and their scales, while seed cones consist of female (pistillate) flowers and their scales. The cones are cross-pollinated by the wind. Afterwards, the pollen cones wither away, while the seed cones continue to develop until they become mature during the fall. Mature seed cones are ¾-1½" long and ovoid-oblong in shape; they are initially green from overlapping pubescent scales, but they later become dark brown and hairless. The seed cones are held more or less erect and can persist on a tree for more than one year, even after the seeds have been dispersed. Behind each scale of the seed cone, there is a broad membranous bract; this bract is shorter than the scale. In addition to the bract, there is a pair of seeds at the base of each scale. These seeds have elongated wings and they are dispersed by the wind. The root system is woody and relatively deep. Cultivation: The preference is full sun, moist to mesic conditions, and fertile soil consisting of loam, sandy loam, or silty loam. Shade and poorly drained conditions are not well-tolerated. Growth is rapid for young trees and more slow for older trees. In Europe, longevity of individual trees can exceed 500 years. Range & Habitat: European Larch has naturalized in NE Illinois, but it is relatively uncommon (see Distribution Map). Habitats consist of woodland borders, moist meadows, edges of yards, roadsides, and abandoned homesteads. This tree was introduced into North America from Europe, where it is typically found in mountainous areas. In Illinois, it is used primarily as a landscape tree. Faunal Associations: The caterpillars of several moths feed on Larix spp. (primarily the leaves): Choristoneura fumiferana (Spruce Budworm), Coleophora laricella (Larch Casebearer Moth), Eufidonia notataria (Powder Moth), Hyalophora columbia (Columbia Silkmoth), Iridopsis vellivolata (Large Purplish Gray, Macaria sexmaculata (Lesser Larch Angle), Panthea acronyctoides (Black Zigzag), Panthea furcilla (Eastern Panthea), Tolype laricis (Larch Lappet Moth), and Zale helata (Brown-Spotted Zale). The larvae of several wood-boring beetles (both Buprestidae & Cerambycidae) also feed on these trees: Anthaxia aeneogaster, Callidium violaceus, Melanophila drummondi, Neoclytus muricatus, Pogonocherus mixtus, and Tetropium velutinum. Other insect feeders include Cinara laricifex (Black Larch Aphid), Oecanthus laricis (Larch Tree Cricket), Plagiognathus laricicola (Larch Plant Bug), and Pristiphora erichsonii (Larch Sawfly). 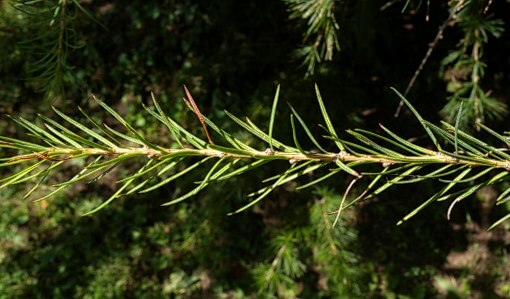 The value of larch to vertebrate animals is restricted primarily to birds, which eat either the seeds or buds. These species include Carduelis flammea (Common Redpoll), Loxia curvirostra (Red Crossbill), and Loxia leucoptera (White-Winged Crossbill). Comments: Even though they both occur in NE Illinois, European Larch doesn't compete directly with the native Larix laricina (Tamarack) because the latter species prefers wetter habitats (e.g., swamps & forested bogs). These two species are very similar in appearance, but they can be readily distinguished as follows: 1) The mature seed cones of European Larch are ¾-1½" in length, while those of Tamarack are only ½-¾" in length, and 2) first-year twigs of European larch are pale yellow, while those of Tamarack are reddish brown. Another scientific name of European Larch, Larix larix, is no longer used.